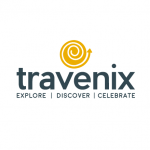 Located at the tip of Mumbai, Colaba is a vibrant locale that has so much to see and do. The name Colaba comes from the language of the indigenous Koli tribe. Like many other places in Mumbai, Colaba is steeped in history but no stranger to modernity. The gateway of India, the artistic Regal theatre and the palatial Taj Mahal Hotel all call Colaba home. Whether you’re here for a romantic day out amongst the cafes and the art galleries or here for a day of street shopping, you are bound to tire out and get hungry. 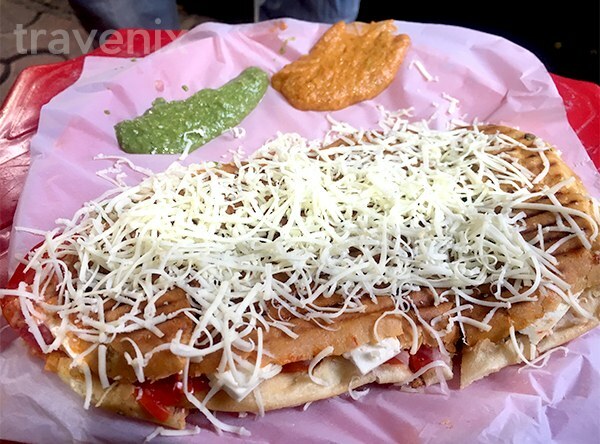 We’ve compiled a list of 15 great snacks to munch on while you’re in the artistic capital of Mumbai. 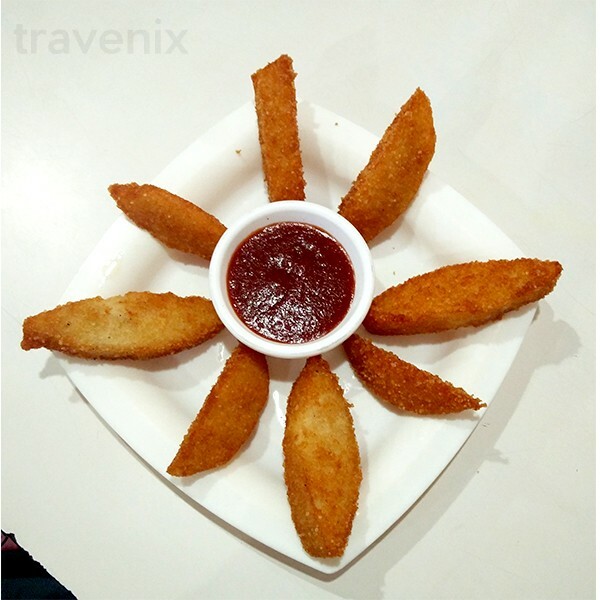 The snacks we’ve picked are the best dishes from the best street cafes, street vendors and chat vendors of Colaba. They’re spread out across the locale and you are bound to run into a couple more during your visit. Fajita refers to grilled meat in Mexican cuisine, but here it is used to refer to the grilled paneer. The Panini bread is fresh, crispy and does not fall apart in the hands. It is loaded with fresh veggies and comes with a good serving of grated cheese. The paneer is soft and perfectly done. It is tangy, spicy and all the flavors just burst in your mouth. 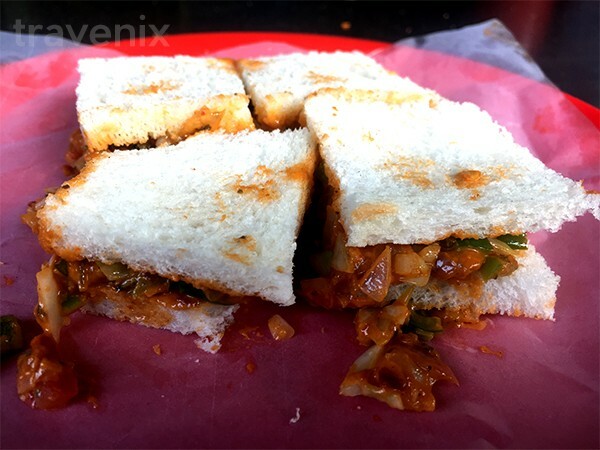 This rich, creamy sandwich is accompanied by some great chutneys and is just an absolute delight to eat. The dish holds true to its name and is as creamy as creamy can get without being overpowering. The chicken is well done, soft and is well marinated in spices. It cuts through like butter and has a great after taste. A great dish to start a well-rounded culinary journey on. This is a very famous summer drink but only a few places get it right. We believe this one comes as close to right as it can get. 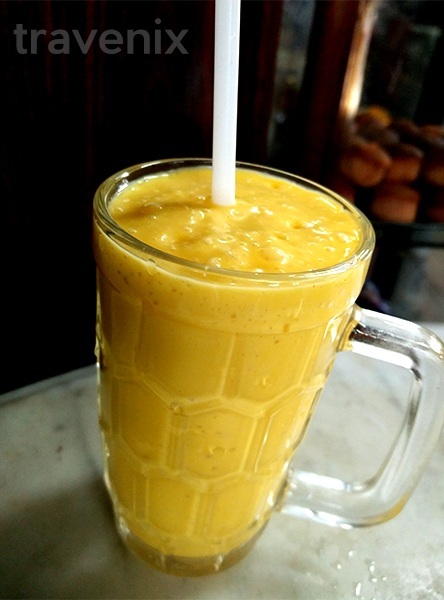 The drink is a sweet marriage between alphonso mangoes and mango ice cream. It has the sweet scent of fresh mangoes and the pulp is present in appreciable quantities. This thick shake is something we’d gulp down no matter how full we were. 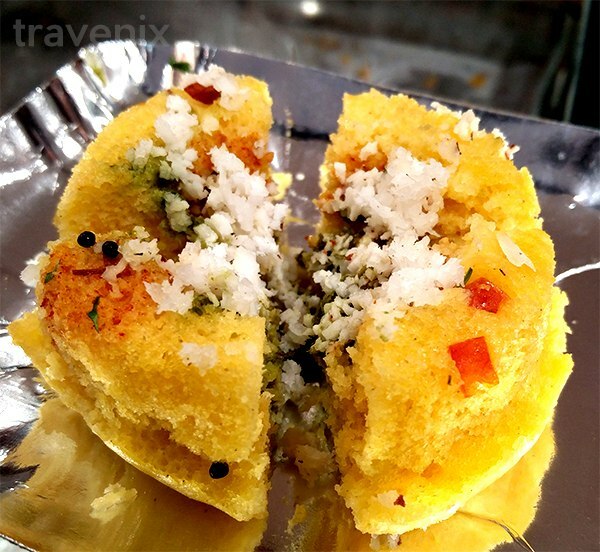 A Gujrati staple, this Dhokla is prepared from crushed chana dal (lentils). The secret to their fluffiness lies in the batter, and Camy Wafer House most certainly has the secret down. The dhokla itself is soft and fresh. If it weren’t for the appetising aromas, one could mistake it for a tiny spongy pillow. It is juicy to the bite and simply melts in the mouth. The centre has further surprises in the form of sweet and green chutneys that just burst forth onto the tongue when bitten into. The centre bite, coupled with the coconut shavings and tomato, throws a great mix of sweet and spicy flavors into the mouth and make the dish more interesting. Do not be fooled by the slightly downtrodden exterior of this coffee house. That is a sign of age and not disrepair. The interior is well furnished in a rustic sort of way, and evokes feelings of warmth and nostalgia. The egg in the dish is perfectly boiled, and a treat to dig into. It is well steeped in spices and the dish is a great gravy accompaniment to almost any Indian main course. The only downside is that it is slightly oily, which is easily ignored if you aren’t on a strict diet. Once you’re done with the main course, stay a while longer to dig into this delectable dessert. This is a visually stunning cake, with its powdery texture topped off with the smooth white of the butter cream. The flavor of the cake will bring back memories of slurping tutti-frutti at the local ice cream vendor. 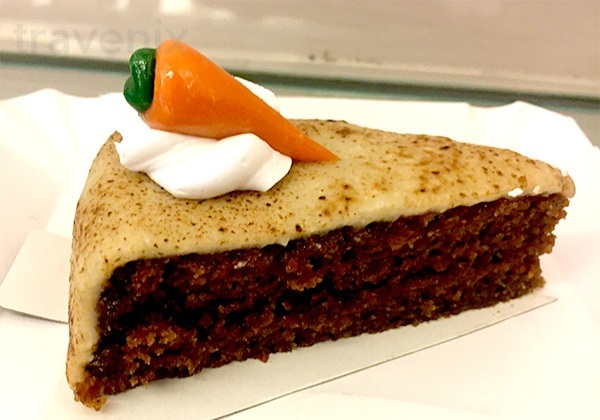 Unless you’re averse to desserts, this one should satisfy even the most demanding palate. We came because of the old school, 90s charm of the place and stayed for the desserts. We simply couldn’t stop ourselves from ordering more. The presentation was unique in that it was served in a glass bowl, which brings out the colours really well. 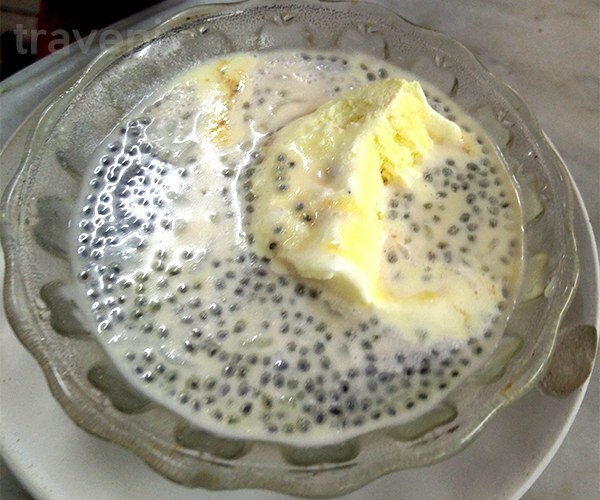 The basil seeds covering the drink are like little black soldier ants, and the falooda sev is smooth and melts in the mouth. Wait a while to appreciate before consuming the drink, because the ice cream needs to melt a little to get it to the right sweetness and consistency. This culinary twist on the classic South Indian breakfast staple is just as simple and tastes just as good as it sounds. 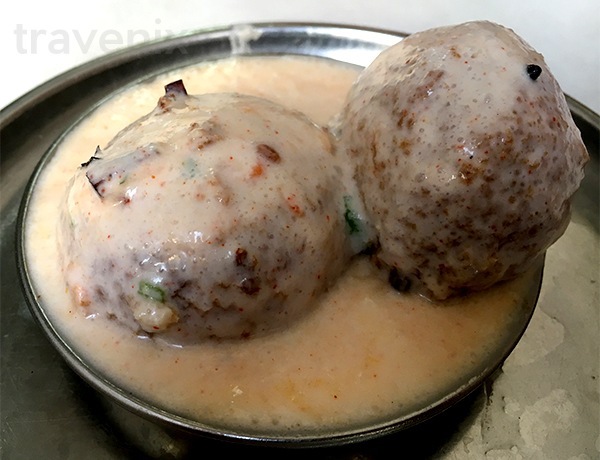 Crisp on the outside and soft on the inside, this will be an instant hit with any idli lover. Served with ketchup and coconut chutney as accompaniment, we simply could not stop asking for refills of the chutney. A simple but sumptuous dish, this fried idli can be your go-to whenever you’re looking for a light snack. An ancient Indian twist on the Western Classic, the tandoori sandwich comes in many shapes and forms. This one is in the form of triple decker toasted goodness. 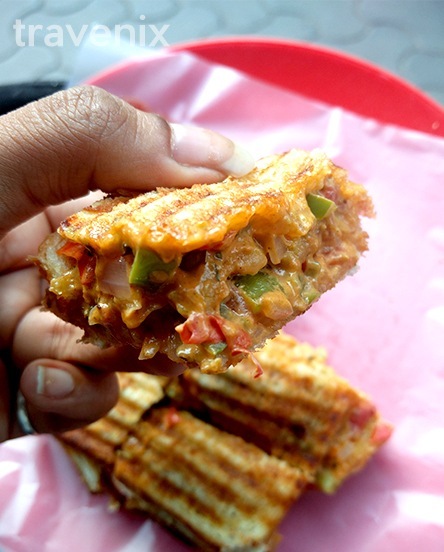 This simple sandwich is loaded with vegetables slathered in the tandoori sauce. There is goodness between the three layers of bread that lives up to the name of the establishment. There is also a hint of dry herbs in the mix, and a tangy taste that we simply loved. If you wanted a slightly sweeter version of the tandoori sandwich featured above, this is the one. However, being very similar to an already good sandwich is not a bad thing at all. In the midst of the thick, creamy texture, the spices come out really well. While not very different from the previous sandwich, it will still hold its own in a battle of sandwiches, and for that reason, we loved it. This is the sandwich that Indian mothers magically throw together when their child is throwing a tantrum and wants something different from the regular. 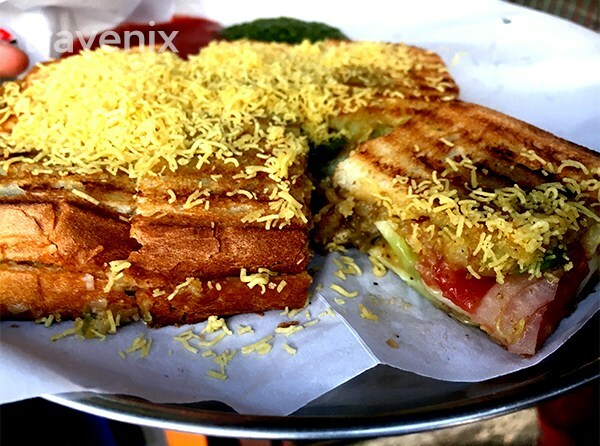 A crispy toasted sandwich with green chutney, mashed potatoes, cucumber and all the regular fare cannot really go wrong. However, that’s the thing, this isn’t a very special sandwich, it has a familiar sort of taste and that can be comforting; but if you’re looking for new street food to try out, you can give this one a pass. The secret to getting upma right is to add the perfect amount of water while preparing the batter. Too much water will make the dish turn out to be pasty, which is not necessarily the death of the dish, but can be avoided. 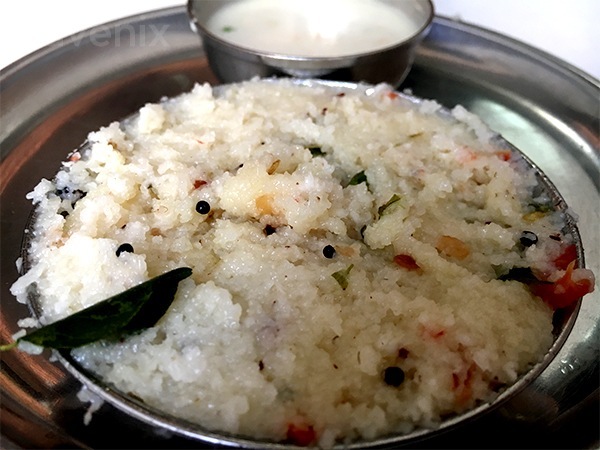 Apart from being a bit pasty, the upma at Ramnath was perfectly cooked. The black mustard seeds burst between bites to fill the mouth with their warm flavor while the rest of the spices do their job. This is a well done light snack. 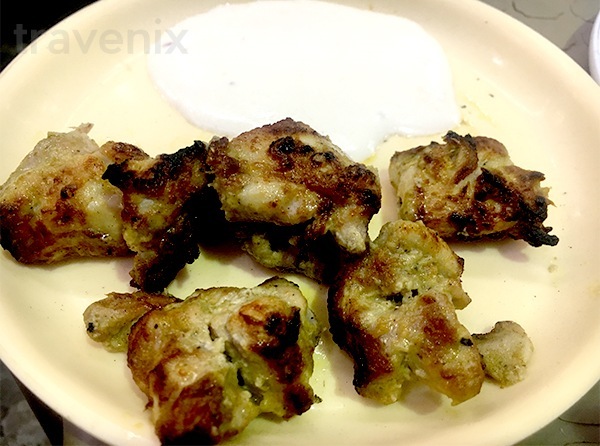 The soft perfectly fried wada is dropped into a visually stunning white, thick dollop of dahi. 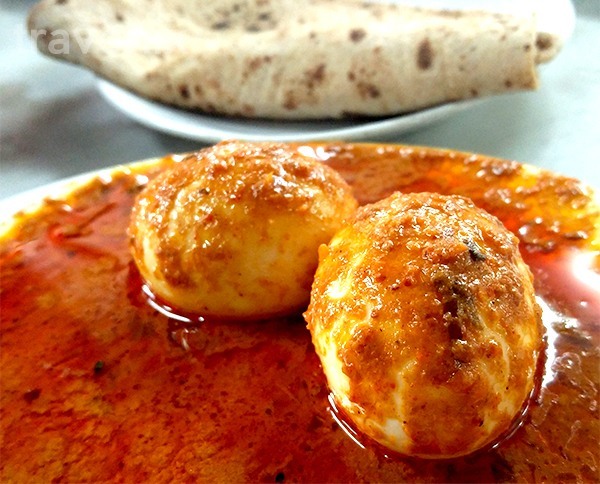 The dahi tastes fresh and is light despite being thick, and the wada is soft as a pillow. With a light tinge of coriander flavor, topped off with coconut sprinklings and the well done sweet chutney, this dish is an absolute delight. A great chat item done to the heart’s delight. The dusk pastry is aptly named for its different hues, shades and tones. The pastry is a dessert of excesses. There is a gratuitous amount of soft, thick white chocolate, syrupy caramel and chocolate icing. 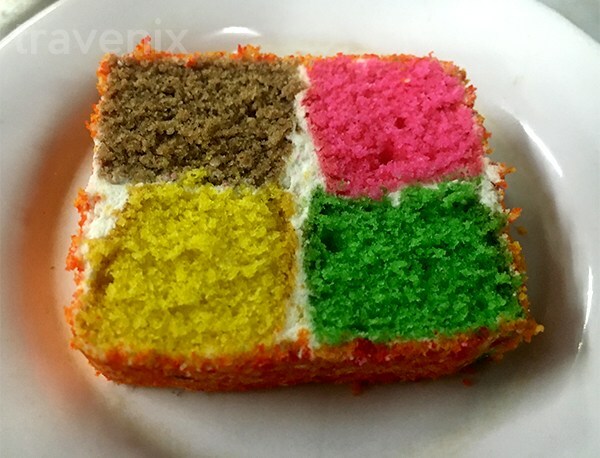 In the midst of all this, deep inside is the soft cake. The taste overall is simply delectable and not for the faint hearted who like a ‘light’ dessert. A hint of lemon flavor adds new dimensions to an already great dessert. Another great dessert from the self-proclaimed master of desserts (and for good reason too). This one is a bit on the lighter spectrum of desserts. Marzipan is a confection of sugar, honey and almonds, which makes for an easy to work with icing. 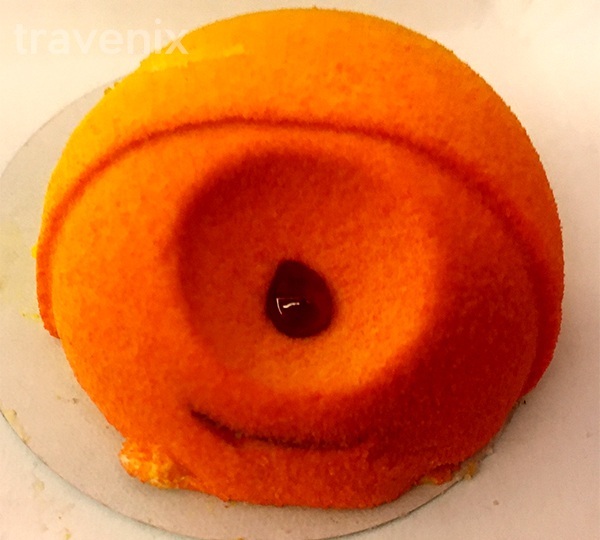 The marzipan in this dessert is beautifully done and just the right amount of chewy, it also holds together the carrot custard. A very delicious and not so sweet dessert. 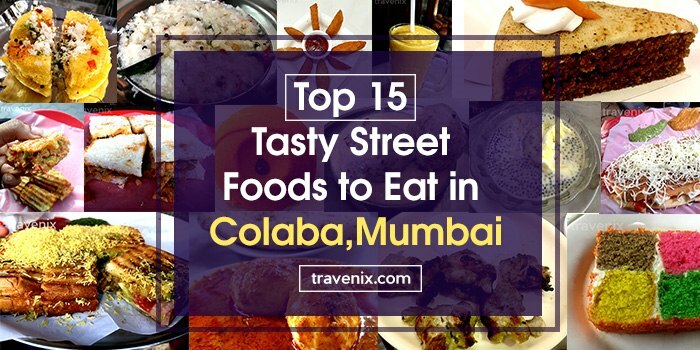 Should you ever find yourself hungry on the streets of Colaba, you know where to go and what to get. Have you tried any of these dishes? If so, what do you think? Tell us in the comments below.